I can’t remember the last time I read something that staggered me in the way Clint Smith’s recent How To Make A Cardboard Box Disappear In 10 Steps did. The poem speaks to the despairing cycle of witnessing innocent black humans murdered and the relentless pursuit of honoring those lives, and demanding justice. The poem is quick but exhausting. Emotionally draining. 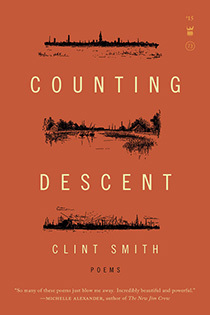 And that’s exactly how his first book of poetry, Counting Descent, published in August, sneaks up on its readers. I’ve watched Clint recite poetry for almost a decade now — he’s a fellow Davidson College alum, and a New Orleans native — but there’s something about seeing the words on the page. The way they invite the reader — only to force us to realize our faults, fears and dreams from line to line. This collection of poetry is terrifying in that way; with every page comes a new emotion we’ll have to face that we’re not quite sure we’re ready for. With every page comes a new emotion we’ll have to face that we’re not quite sure we’re ready for. The strongest aspect of Counting Descent is family. Smith’s love for his parents and their parents before them, how they toiled and fought for better for subsequent generations — this is celebrated throughout the book. And while it’s easy to look at his work and see sadness about the world around us, the true hope lies in his family’s insistence on surviving — and raising children who have a chance to do the same. Smith’s most brilliant moments come in a series of poems in which various inanimate objects and animals speak to black boys. In “what the cicada said to the black boy,” the line “every time you swarm they shoot” collapses sadness, fear and the reality of our lives into one poignant sentence. This collection of poems is the literary soundtrack for Black Lives Matter and the post-Obama America … and the terrifying prospects that lie ahead.